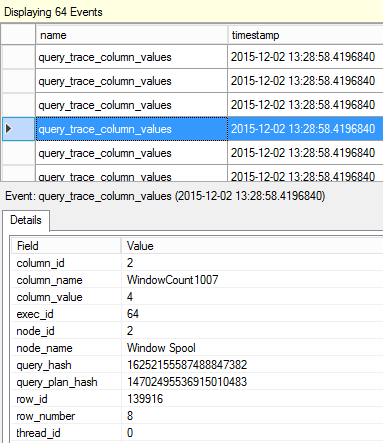 I will use the query that calculates running total in the DB opt. The query plan uses Window Spool to implement running total logic. undocumented trace flag 2486 should be turned on on the session level. Next we start XE session, open Live Data window (right click on the session name “Watch Live Data”) and re-run the query with the mentioned conditions. There were 64 events produced for this execution. We may multiply the number of rows in each plan operator (except Compute Scalar because it might be not a “classical” iterator, but a placeholder for defining expression that is calculated somewhere else in the plan). Unfortunately, it seems that this event works only for the Row Execution mode, I tried and got no luck with Batch execution. Before you start using this XE imagining your own scenarios and exploring SQL Server behavior I should mention once again, that this is not documented and maybe verbose. Also, firing an event, each and every time the column of the row is processed is not free, I didn’t measure the impact of enabling this event, but I think it should be considered. Because of all that mentioned above, use it carefully and in the test environment only. I also would like to thank Microsoft dev team for keep adding those cool features and making server more transparent.